Bio/Data PAP-4 Platelet Leukocyte Aggregation HIT Profiler Four-Channel Assay . New Life Scientific, Inc. 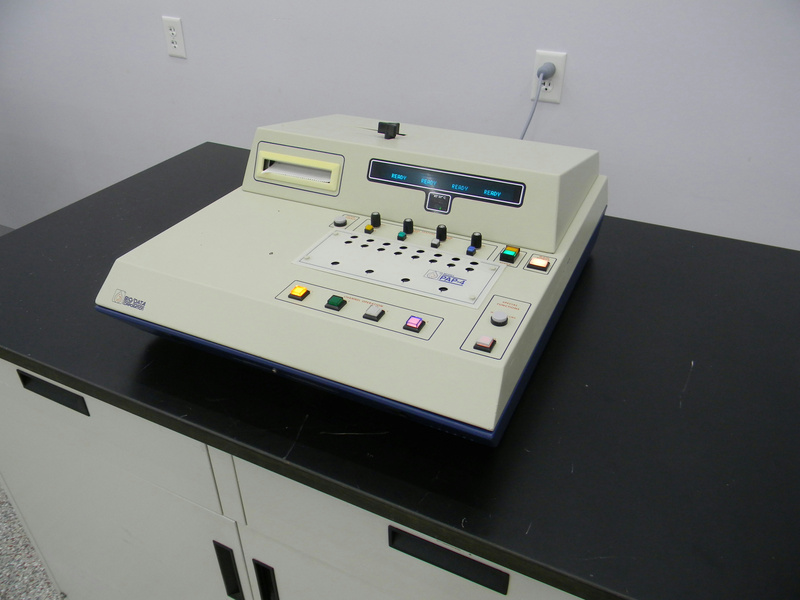 This PAP 4-C is a used instrument that does have signs of wear and age. The product was manufactured in 2003 and was acquired with a broken printer latch that was repaired and outfitted with a knob. New Life Scientific technicians tested the equipment to the best of their means beyond initialization, by running a test option and confirming all buttons respond; the results returned 'invalid' results, because the testing was dry. The light behind the channel-3 button does not light but the button does. The stirrer functions and adjusts along with the heater. The latch on top for the printer paper was broken and has been replaced with a knob so it can be opened easily. This instrument will be sold as a used working product and NLS offers a 90-day warranty to the customer. If the product has defects or does not meet the customer's need, they can return it within ninety days of receiving it. For more information about the warranty terms and product, please contact New Life Scientific.